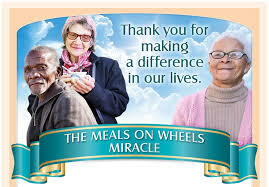 For the last 50 years the Meals on Wheels organization, have been serving meals to the elderly and people in need. With the help of volunteers, these meals are prepared. Donations are received from small companies and shops, private donors, as well as some corporate companies. The food is provided by donors from within the community. About 10 million meals are served every year in South Africa. But serving meals is not the only service this organization has. Both these programmes are dependent on volunteers.